On March 6, LEGO announced its results for 2017. Sales declined by 8% and profits dropped by 18%. These results are a striking exception to the company’s recent stellar performance. But there are lessons from LEGO’s recent performance that can help the company find its next source of growth. 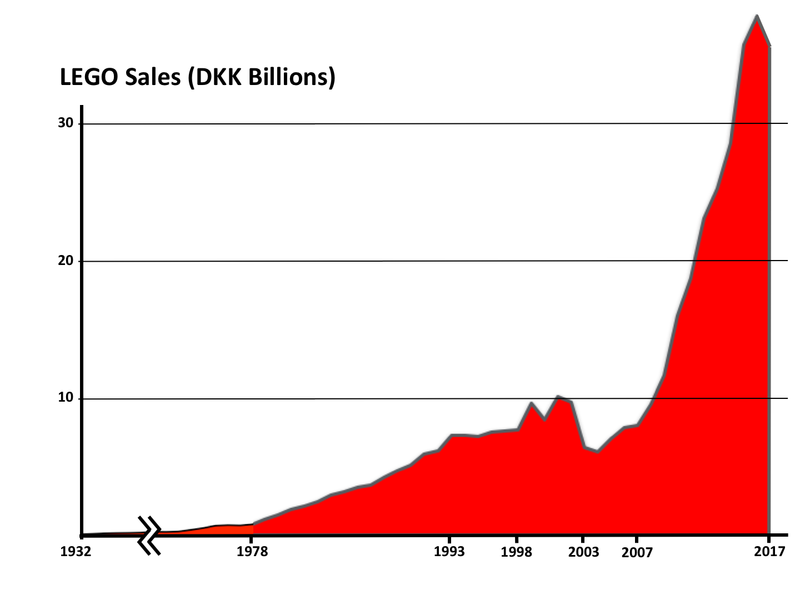 Below is a chart of the LEGO’s complete sales history from its founding in 1932 through its most recent year. LEGO faced bankruptcy in 2003, made some major internal changes, and in 2007 began a period of eight years of 21% annual sales growth and 36% annual profit growth. The streak slowed down in 2016 and seemed to come to a crashing end in the middle of 2017. Last summer, the company reported a reduction in sales in the first half of 2017, replaced its CEO, and announced that it was reducing its workforce by 1400 people. Having written a book about LEGO’s near death and spectacular recovery, I have been following the company with interest for the past decade. Observing how LEGO achieved one of the great turnarounds in modern business history has been enlightening. But LEGO’s response to its current difficulties is just as interesting; the company’s challenges pose a new and different set of lessons. 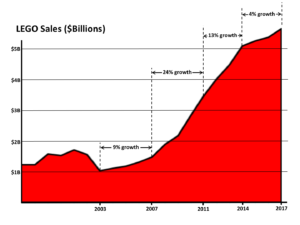 LEGO is facing a common corporate dilemma: what do you do when your current growth phase ends? I believe that LEGO’s current growth streak ended three years ago in 2015, not last summer. 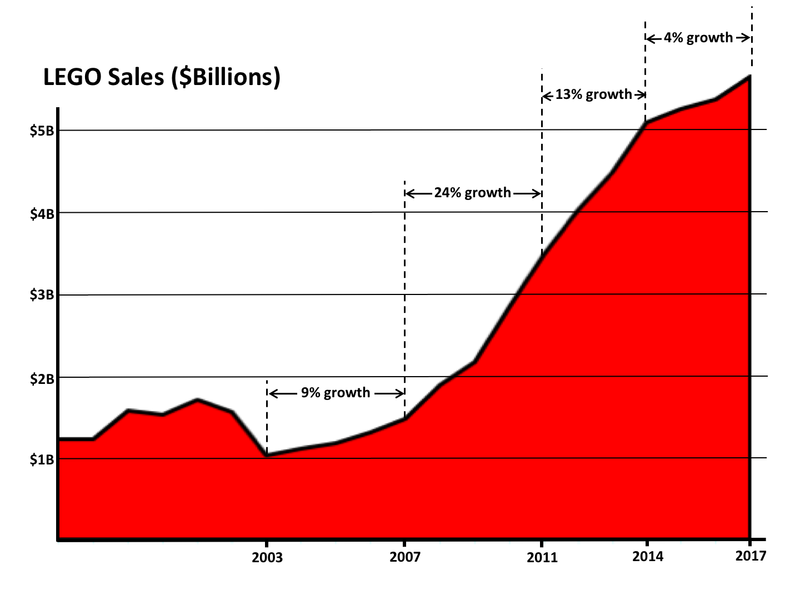 This may sound surprising, given that the company reported sales growth of over 25% that year. 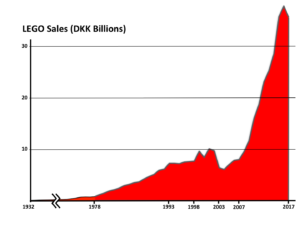 But while LEGO reports its financials in Danish Kroner, it makes much of its sales and profits from the U.S. market, and 2015’s growth was almost entirely due to currency fluctuations. Viewed in dollar terms, the company’s sales growth in 2017 was its highest in three years. The company still has a great deal of work to regain its double-digit growth rates of the past decade, but there are some positive signs that this has begun. So, given that it’s been three years since LEGO’s recent growth cycle ended, what can we learn from the company’s recent performance? Quite a lot. LEGO’s struggle to find the next source of growth provides an important set of lessons for any company looking to innovate. If LEGO hasn’t found the next big thing, it’s not for lack of trying. Beyond the steady introduction of traditional brick-based play themes and sets, LEGO’s been experimenting with a wide range of other play experiences. These new types of play can be clustered into two distinct categories: digital and traditional. You can think of first of these as moving LEGO toward competing with Sony or Microsoft, and second as moving it toward competing with Disney or Universal Studios. LEGO Life. Launched in January of 2017, LEGO Life is a social network for kids, basically a LEGO-themed mashup of Facebook and Instagram. Kids can display their LEGO creations, respond to building challenges, and connect with other LEGO fans. There are careful controls to prevent online bullying or abuse. The site features only minimal ads, and the ads are only for LEGO products. This website is an expensive proposition, and it hasn’t taken hold in the LEGO community. LEGO Fusion. LEGO Fusion was a mixed physical and virtual play experience introduced in the U.S. in 2014. In LEGO Fusion, you could build something using physical bricks, take a photo of it, then play with it in the app. For example, the Create and Race set allowed kids to build a race car, snap a picture of it, then race a virtual version of the car around a track in the iPad app. The app didn’t work well – it was confusing and buggy, and the company dropped the toy line after one year. Movies and television series – The LEGO Movie from 2014 and 2017’s The LEGO Batman Movie and The LEGO Ninjago Movie were all commercial successes. The company has had a dozen different television series in the past decade, including a Ninjago-based series – now in its eighth season – and a LEGO Friends series that launched in 2014. LEGOLand Discovery Centers. LEGO has been converting defunct department stores into indoor LEGO-themed playgrounds. These have been successful, and are one of the few bright spots in an overall dismal US retail environment. LEGO Friends – This series of sets targeted toward girls, launched in 2012, has pink and lavender bricks, unique play themes, a redesigned mini-figure, and a predominance of female characters. The toy line has recently expanded into Elve-themed sets, and sets licensing the DC Superhero Girls characters. The company has focused a great deal of resources on the first category of innovations – digital innovations. Management is clearly worried that digital play experiences like Minecraft and console videogames will disrupt LEGO, and the company will be left behind. But as a parent and fan of LEGO, I bought LEGO for my kids because it distracted them from screens! LEGO was one of the few toys that could draw their attention away from Minecraft, Xbox, or other digital play experiences. I believed (and still believe) that the fundamental skills that LEGO play develops – 3D spatial reasoning, creative construction, and fine motor skills – are hugely important. The market as a whole seems to agree: it rewards LEGO when it moves away from digital. In other words, we want LEGO to be more like Disney, and less like Sony. But this is not a critique of LEGO. No one is doubting the long-term disruptive potential of digital technologies. The company has to continue experimenting with digital digital play. It has to explore the melding of physical and virtual experiences. But those experiments shouldn’t dominate the company’s focus, as it apparently has over the past few years. Instead, LEGO should follow where the market leads the company: more movies, more play parks, and more types of physical play sets. These innovations are what will restore the company’s growth. What Lessons Can Lego Teach Us? It may seem odd to advise companies to “innovate like LEGO” when the company just announced a sales decline, replaced its CEO and laid off 8% of its workforce. But the lessons from this phase in the company’s evolution are just as important as the lessons from its turnaround a decade ago. What are they? Nothing lasts forever. This may sound obvious, but it’s not an easy message to communicate to your organization when sales are growing at double-digit rates. But if LEGO had begun its tightening and redirection efforts back in 2015, the company would have been farther along in its next phase today. Building momentum toward the next major growth area has to start before the first one is done. Experiment during the good times to prepare for the bad times. LEGO has invested the profits from its spectacular performance over the past decade to experiment with a range of different LEGO-themed play experiences. Some have succeeded, others have failed. While duds like LEGO Fusion aren’t ideal, there’s much that can be learned from the experiment. And the experiments like the LEGO Discovery Centers and the feature-length movies have turned out to be winners. Devoting resources to experiments during the good times helps prepare you for the bad times. Watch what works and follow where your customers lead you. The company has continually experimented in many different areas, but doesn’t seem to be listening to the results of those experiments. LEGO has success when it tells stories that kids can play out with bricks, and loses when it tries to move its bricks online. LEGO’s new CEO, Niels Christiansen, has a big challenge ahead of him. The company competes in a stagnant market with aggressive competitors, a commodity product, and fickle customers. It has been superb at maximizing the revenues it receives from its product over the past decade, but it’s near the end of this phase of its growth. If Christiansen and his team keep trying to find growth through digital play experiences, the company’s struggles are likely to continue. If it follows where its customers are leading it, everything will be awesome again.